Think of Edinburgh and one cannot miss the famous Scotch whisky. Original Scotch whisky - malt whisky formed an intrinsic part of Gaelic life. It served as a warm drink during the long and cold winters. It was used as an anesthetic, for sword cuts and during childbirth. 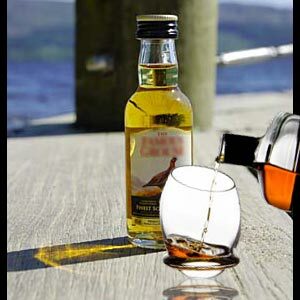 Whisky even served as Communion with oatcakes when there was no bread and wine at the Battle of Culloden. Evidences suggest that distilling was initially attempted in Asia as far back as 800 BC and came to Europe via Egypt. When it was first produced in Scotland, whisky was called 'uisge beatha' - the water of life. It became an integral part of Scottish history and culture. The process of preparing whisky comprises five stages - malting, mashing, fermentation, distillation and maturation. The malted barley is soaked in water till it germinates. Then it is subjected to drying over peat fires. The dried grain is then ground and mixed with warm water to make a mush. This wort is mixed with yeast and left to ferment in huge vats for about 36-40 hours. An alcohol-based beer-like liquid called 'wash' is the resultant. It is heated in copper kettles and the vapor is distilled by passing it through coils of cooled copper pipes. This distillation is done twice. Water is added, if necessary to achieve the correct alcohol content. This distilled spirit is stored in huge oak barrels or hogsheads. The Scotch Whisky Act of 1988 requires that the whisky must be kept to mature for not less than 3 years though well-known brands are typically matured for about 8 - 15 years. Whisky that has been kept for longer to mature is mellower and fetches a higher price. The tannins and wood sugars also play their part in maturing of the Edinburgh whisky. Scotch whisky has now come to maintain its position as the premier international spirit.